Having a patio cover installed at your home in Albuquerque, New Mexico, or a surrounding area, can be a quick way to enhance the aesthetic appeal of your home while also allowing you to enjoy your backyard space like never before. However, it can be hard to know what type of product will work for your home. Low maintenance requirements – With baked-on enamel and an embossed cedar or stucco finish, your new cover will be able to hold paint up to three times as long as wood. Aesthetic appeal – One of the most important functions an effective patio structure should have is its ability to enhance the aesthetic appeal of your backyard space. With many styles of covers available at ABC Seamless, you will be able to find something that will perfectly complement the existing exterior of your home. Durability – Our products feature a strong, aluminum, cover with 4-inch thick insulated foam so that they are sturdier than wood and will help keep out the sun’s heat. 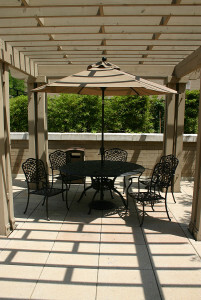 Thankfully, ABC Seamless of Albuquerque can install an exceptional patio cover at your home. And, should your needs ever change, our covers can easily be converted to a room enclosure sometime down the line by easily adding walls and windows. For more information about the patio cover options available to residents of Albuquerque, NM, and the surrounding areas, contact ABC Seamless of Albuquerque today.